So on my way home from work I had to stop by Wal-Mart and funny thing, is this for real?? Why oh why Wal-Mart - what are you trying to accomplish! 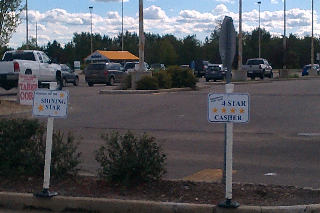 Special Parking for their shining star and their 4 star cashier?? I do not know what else to say! except... say what! ?